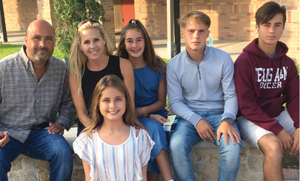 The Covarrubias family: Alejandro, Melissa, Renata, Valentia, Artem and Alex. Melissa Covarrubias and her family of six are frequent givers. They use a simple method for earning what is given and deciding whom to give to. Frankly, they have to work for it. Covarrubias ensures her children are always learning, be it about academics or simple life lessons. “Our kids have to work for their money, said Covarrubias. “And once they earn it, we make them save some, spend some and give at least 10 percent.” The girls have household chores, and the boys have a lawn service for the neighborhood, plus they put away some cash from those annual birthday cards, too. “The children are also given the flexibility to give wherever they feel there is a need – it may be the church, an animal shelter or close friends in need, but they must find a place to donate,” said Covarrubias. Recently, the family collaborated on their choice and selected to help a family who receives assistance from Hope For Three, the only non-profit in the Greater Houston area to focus on autism and provides financial assistance to families in need in the Fort Bend County area. Laura Guerrero is a single mom of three young kids, all diagnosed with autism. She is a teacher and has no family support, so she is grateful for the help of Hope For Three and her local church. Hope For Three estimates that it takes around $60,000 a year to support just one person with an autism spectrum disorder. Additionally, these families humbly need respite and lots of community support. When the Covarrubias family heard about Guerrero’s plight, they jumped right in to grant the family’s “wish list.” Guerrero’s biggest request was to be able to provide her daughter with a birthday present. With the earnings from just a few month’s work, the family was able to provide Guerrero’s daughter with a doll, some playdoh and a book for her birthday. Plus, they gave all three children new backpacks, clothes, school supplies and a few toys. Guerrero also received $200 in gift cards, which she wisely used on groceries and gas. Autism is the fastest growing children’s disorder, more prevalent than AIDS, cancer and diabetes combined. Children on the spectrum may be uniquely different but not less. Autism acceptance and inclusion is a crucial component in building relationships and learning life skills, regardless if it is through therapy, education on the playground, church, store or restaurant. Children with autism want to enjoy and do what other children enjoy too. When the uniquely challenging task of raising children is supported within a diverse community, it benefits families and society and, creates communities of inclusiveness and respect. To learn more about Hope For Three or to provide volunteer services or a tax-deductible donation to support families like the Guerrero’s, contact Hope For Three at 281-245-0640 or email contact@hopeforthree.org.